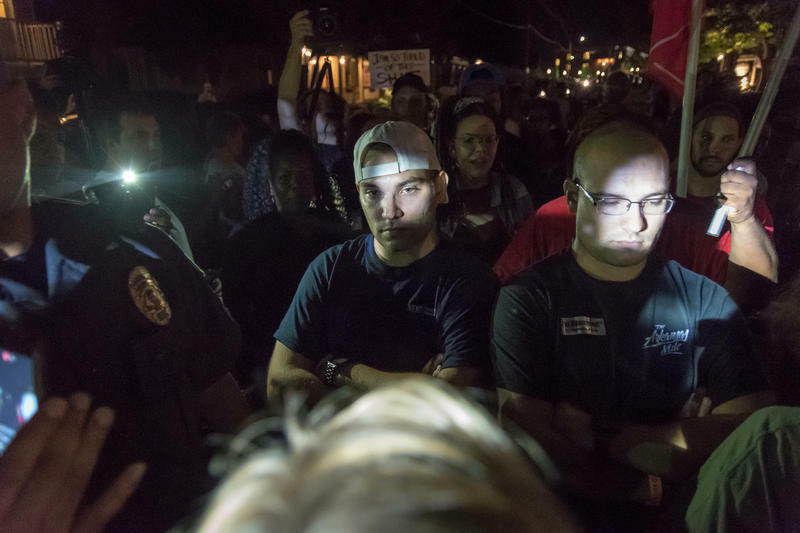 Two men confront a crowd of demonstrators during a protest Friday night in St. Charles. 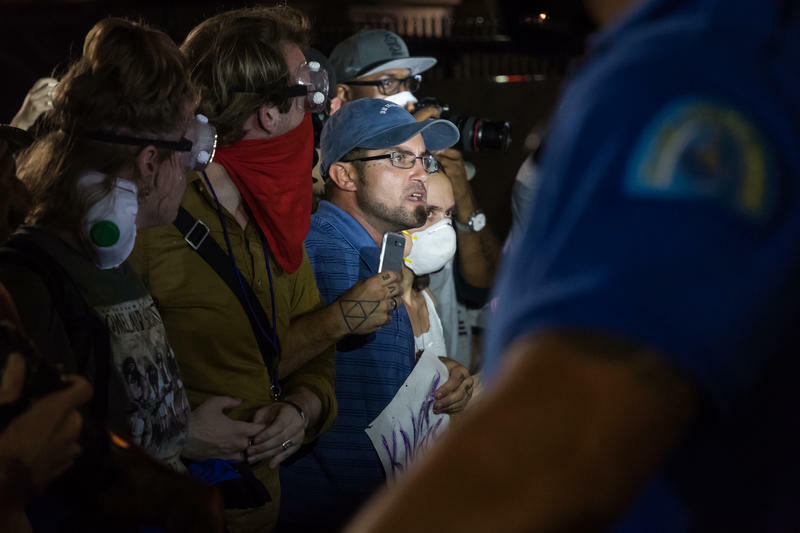 It was the eighth day of protests following the not-guilty verdict of white ex-St. Louis police officer Jason Stockley on first-degree murder charges. A protester speaks to the crowd during a demonstration in downtown St. Charles Friday night. 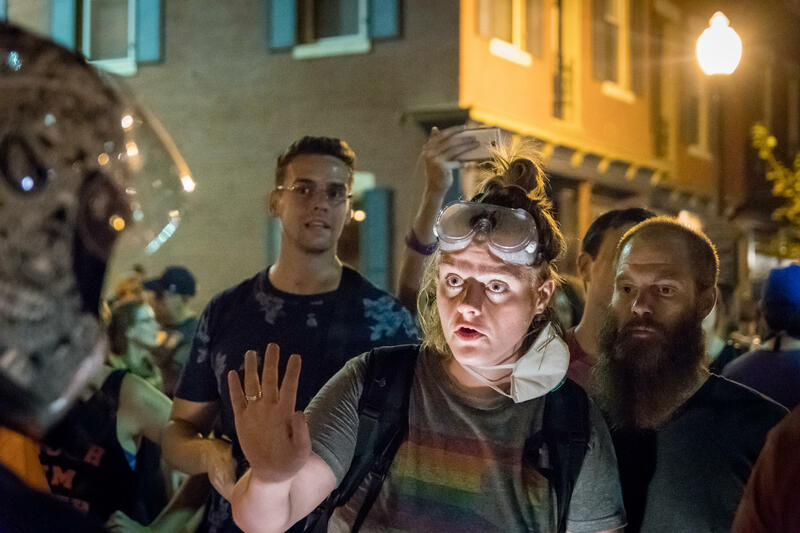 It was the eighth day of protests following the not-guilty verdict of white ex-St. Louis police officer Jason Stockley on first-degree murder charges. 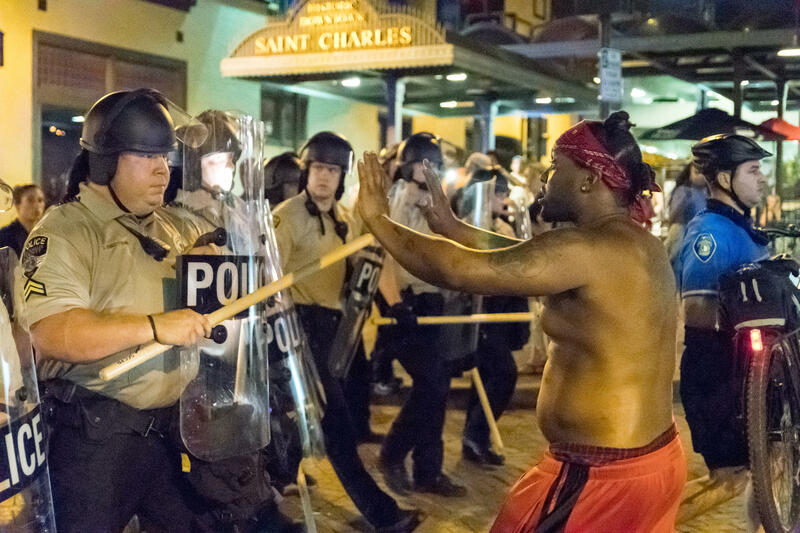 Police briefly clashed with a few demonstrators toward the end of a protest in downtown St. Charles Friday night. One week after a judge acquitted former St. Louis police officer Jason Stockley of murder in the 2011 death of Anthony Lamar Smith, protesters continued their push for change, taking their message Friday to the mostly white city of St. Charles. After a brief stop at the St. Louis Outlet Mall, protesters headed for the Oktoberfest festival, where they intended to continue disrupting business as usual as they push for structural change in the region’s institutions. A protester squares off with a motorcycle driver who refused to turn around for a demonstration in St. Charles over the acquittal of white ex-St. Louis police officer Jason Stockley on first-degree murder charges in the death of Anthony Lamar Smith, who was black. Some protesters said it made perfect sense to continue taking their message for reform of St. Louis institutions to St. Charles, where the population is 88 percent white. Their trip to the town of about 70,000 follows similar visits to affluent areas in or near St. Louis — the Central West End, the Delmar Loop, downtown Clayton, and the St. Louis Galleria. At one point, the driver of a Jeep blew its horn and tried to inch through the crowd. Minutes later, another car did the same, prompting protesters to strike the car with American flags and the red, black and green flag of black liberation. Its driver backed up. 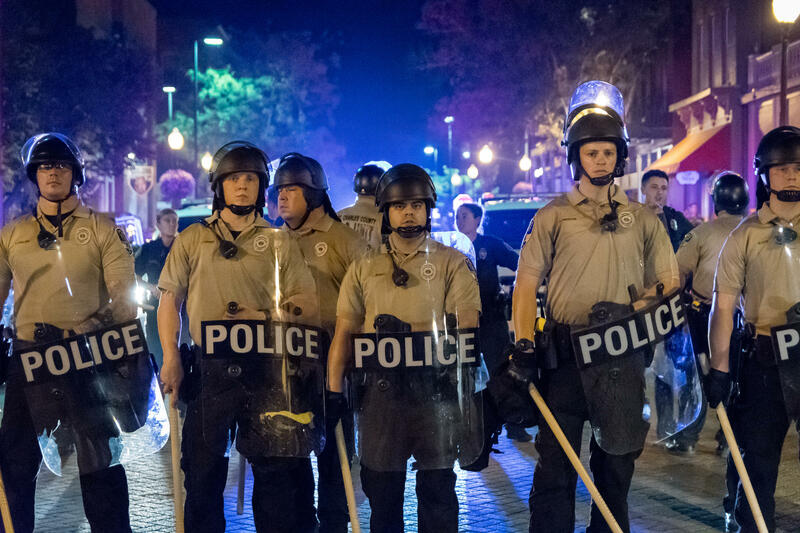 Police officers stand on Main St. in downtown St. Charles during a protest Friday night by demonstrators upset with the not-guilty verdict of a former St. Louis police officer on murder charges. Protesters then began blocking the intersection of Main and Jefferson streets. As the protesters tried to hold six minutes of silence, someone yelled "Blue lives matter." St. Louis Alderman John Collins-Muhammad then shouted that he wanted the period of silence to start again. Another onlooker called Anthony Lamar Smith, who Stockley shot after a chase, a heroin dealer. Some of the protesters began the night’s demonstrations at the St. Louis Outlet Mall. But their intention to disrupt the mall likely caused its operators to close it. The mall announced on its Facebook page that it would close at 5 p.m., hours early. For eight days, people in St. Louis have decried the judge’s ruling as another example of how the judicial system fails to hold police officers accountable, especially a white officer who kills a black person. To prevent such deaths, the courts will have to take stronger action against officers whose actions lead prosecutors to charge them, said 29-year-old Cody Costakis, of St. Peters. 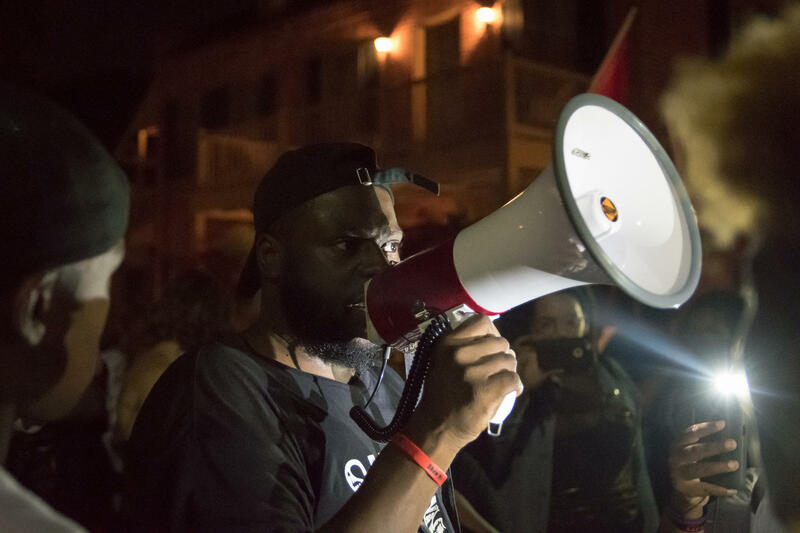 Demonstrators hold a six minute-long moment of silence Friday night in St. Charles to mark the time since the death of Anthony Lamar Smith, a black man. Protests started eight days ago when former police officer Jason Stockley was acquitted on charges of murdering Smith. “If the court system is changing the way [the police] enforce laws, then the police will change their behavior,” Costakis said at the outlet mall. Patricia Harris, who also was there, held a sign that read, “My son matters.” Harris, 38, said she worries about his future. “I’m fighting for my son, my black son. He’s 6 years old. He doesn’t know what’s going on right now. But soon, he will,” she said. “That frightens me, breaks my heart that I have to have conversations with him about the injustices he’ll have to face. I think [the protests are] empowering us to come together. “The difference between now and Ferguson is that we are taking it different places and it’s making people uncomfortable. They’re having to deal with us. Before, it was all in Ferguson. I feel like we are making some difference. We are not backing down," she said. Earlier Friday, a small group of people gathered in front of the Carnahan Courthouse in downtown St. Louis in support of openly carrying firearms. About a half-dozen people with long guns stood on the sidewalk in front of the courthouse. One person brought a bow and arrow to the demonstration. Dhoruba Shakur said he believes African-Americans would be safer if they armed themselves. 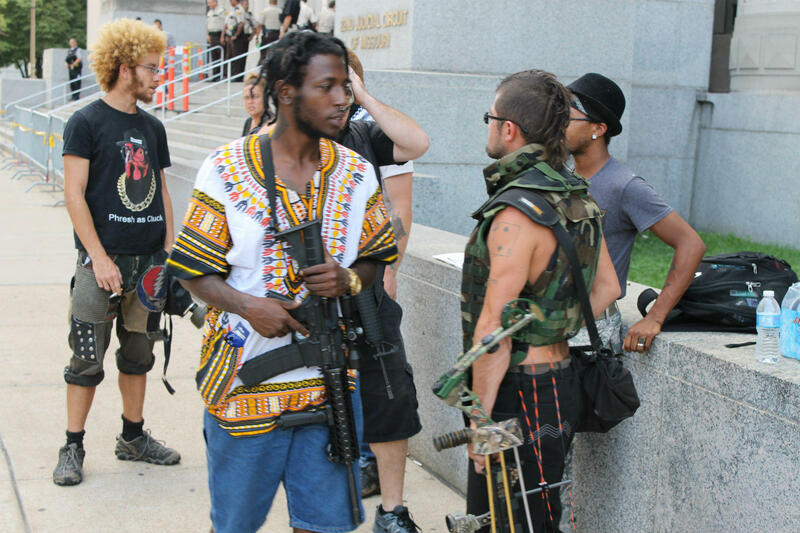 Dhoruba Shakur talks with a participant in an open carry rally Friday in front of the Carnahan Courthouse in downtown St. Louis. The GOP-controlled Missouri General Assembly passed a law in 2016 that allowed local governments, like St. Louis, to prohibit people from carrying weapons openly unless they have concealed-carry permits. But St. Louis city counselor Michael Garvin told the St. Louis Post-Dispatch last year that the city doesn’t enforce its open carry ban because state law has preempted most, if not all, local restrictions. The courthouse rally had a tranquil atmosphere, with participants chatting amongst themselves while pedestrians walked down the sidewalks. St. Louis Public Radio's Jason Rosenbaum and Ryan Delaney contributed to this report. 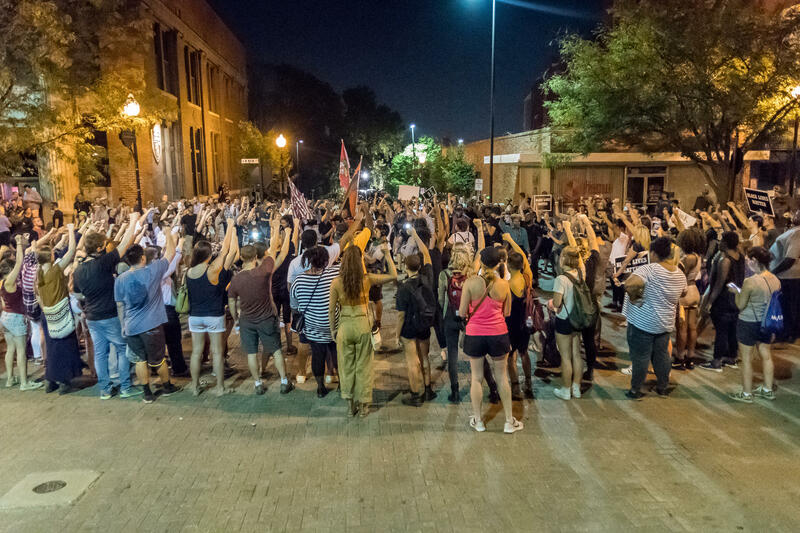 Updated at 9:40 p.m. with additional details — Hundreds of “white allies” marched in the streets downtown on Thursday. Their aim was to demonstrate broad support for the protest movement sparked by a judge’s decision to acquit a former police officer of murder. For more about 90 minutes, a crowd of predominantly white demonstrators expressed solidarity with African-Americans. 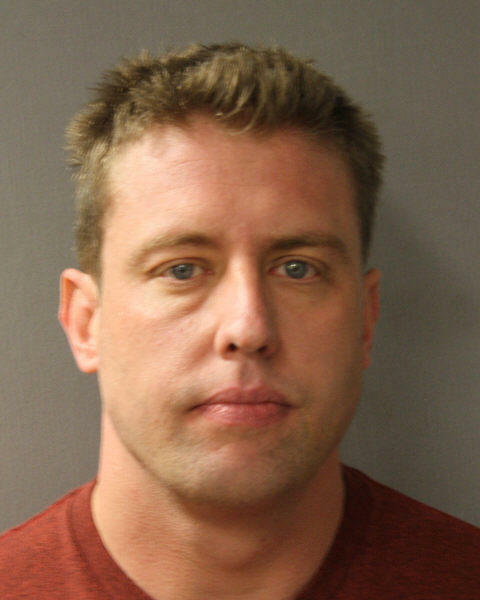 For the past week, many have protested St. Louis Circuit Judge Timothy Wilson’s decision to find Jason Stockley, who is white, not guilty of murder in the 2011 death of Anthony Lamar Smith, a black man.